I love sports. The classic match-ups. The iconic venues. The unforgettable moments. I was lucky enough to be back in Boston last weekend for work. In between conference sessions I had a pretty good steak at Davio’s, made a return visit to Stoddard’s to meet a friend, saw the memorial on Boylston Street, and drank a few good pints of craft beer (Allagash White, Samuel Smith Oatmeal Stout, Ommegang Abbey Ale) at the conference’s hotel pub. But mostly I was lucky because I got to experience one of those iconic venues. 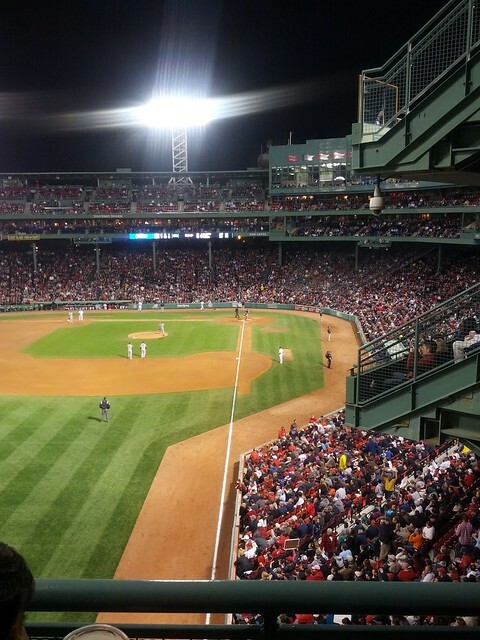 I got to watch a Red Sox game at Fenway Park, from atop the Green Monster no less. I ate a ballpark dog and drank a Sam Adams. 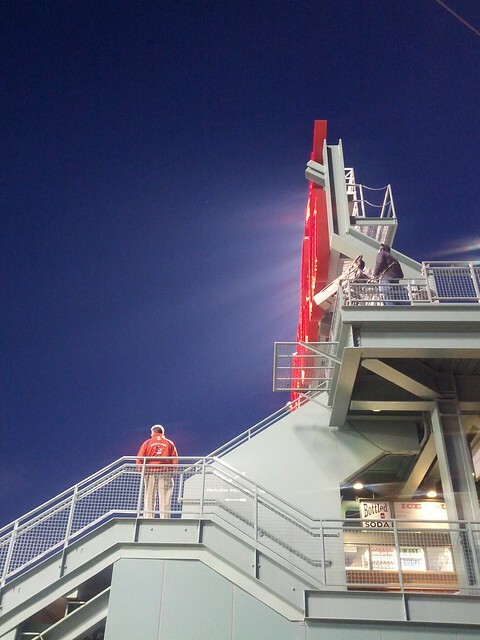 I leaned out and touched Carlton Fisk’s foul pole. I listened to the crowd sing “Take Me Out To The Ballgame” and, much more emphatically, “Sweet Caroline”. I watched David Ortiz crank a 439-footer to straightaway center not a week after his hilariously inspirational speech following the bombings. I watched the Sox beat Houston 7-2 on a blustery April evening and couldn’t think of anything more Bostonian to do. The next day I flew back to Toronto, just ahead of my parents who flew in from Moncton for a (not quite) two-day stay. 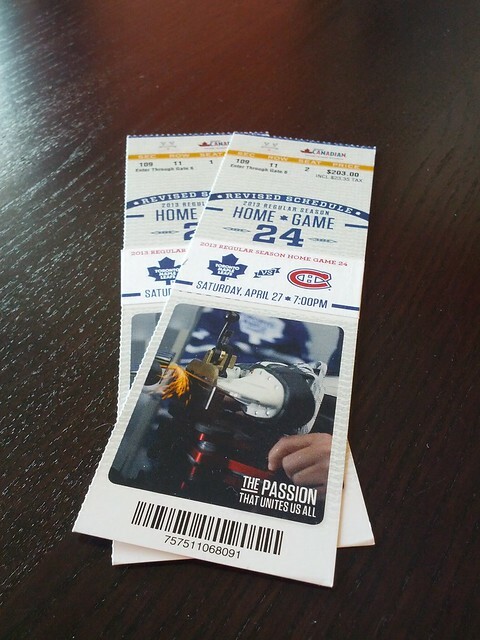 We had dinner at Starfish, explored the Distillery District, and sampled some of the breakfast sausage we made last weekend, but the real reason they were here was to see one of those classic match-ups: the Montreal Canadiens vs. the Toronto Maple Leafs on Saturday night. Nellie had somehow lucked into gold seats for the final game of the season, and gave up her seat so that my dad could watch his first NHL game in 49 (!) years and our first together. 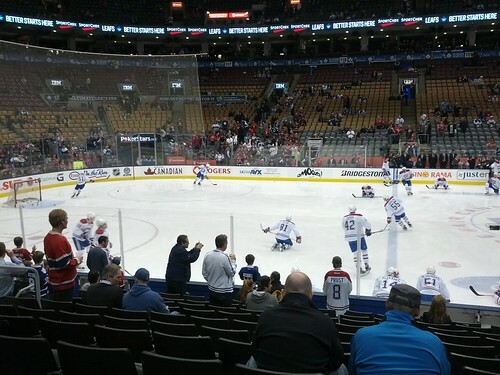 Luckily for me, my Canadiens won. I felt bad that my dad had come all the way from Nova Scotia to watch his beloved Leafs lose, but I’m sure he felt the same way I would have had my team lost: just getting to watch such a big game together is now one of those unforgettable moments that sports can sometimes produce.